Illinois State University continues to make progress in its longstanding commitment to create a more inclusive and hospitable environment for employees and students alike. Wilma Bates of the Campus Climate Task Force makes a point at a meeting. The Campus Climate Task Force wrapped up a year of gathering data and hearing from groups across campus to develop short- and long-term recommendations, including one for a University Diversity Council. A final report is expected this fall. The administration’s Implementation Team is pushing forward to address short-term solutions, and working to create web pages that will allow transparent updates on the progress on answering the task force suggestions. 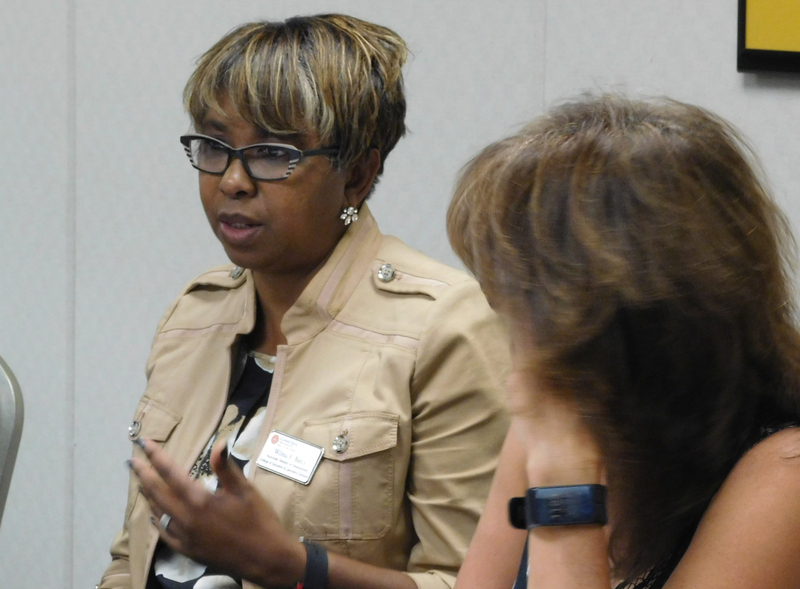 Moving beyond conversations was the goal of a group of College of Arts and Sciences administrators and faculty who came together for the CAS Leaders in Action: Engagements with Diversity in the College. The group’s goal is to find a path toward increasing faculty diversity. Diane Guerrero was the featured speaker at the 2016 Latino Cultural Dinner. 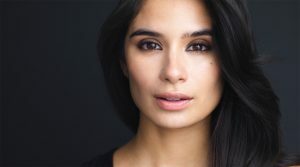 Diane Guerrero addressed a sold-out Cultural Dinner with compassion, recounting her family’s struggles as Latinx in the United States. Marc Lamont Hill’s keynote for the Martin Luther King Jr. Cultural Dinner resounded to another sold-out crowd as a call to action for young people. The International Seminar Series examined peace and conflict across the globe, with speakers exploring such topics as “Islam Beyond Violent Extremism” and “Co-existence and Exchange Efforts Among Jews and Arabs in the Context of the Israeli-Palestinian Conflict.” Professor of History Amy Wood and Assistant Professor of Art Vanessa Schulman tackled the history of the intersection of race and voter suppression during the Super Tuesdays: the Culture of Voting Lecture Series. 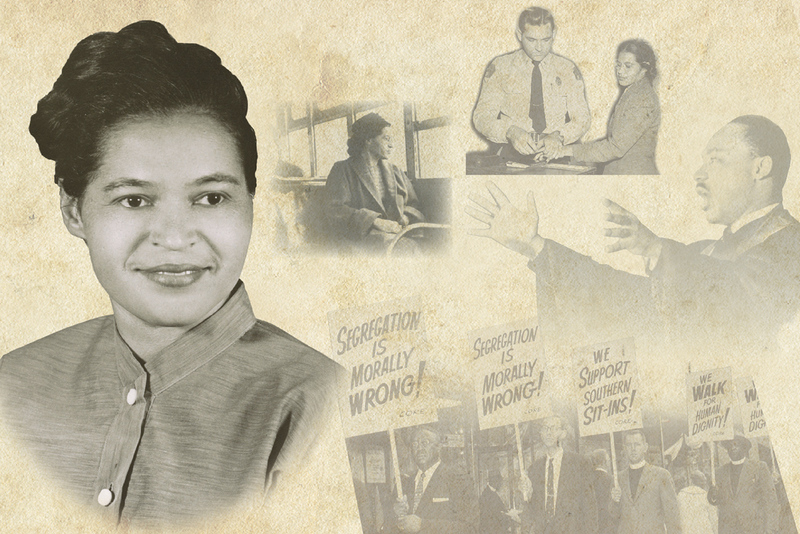 A montage of images in the new Rosa Parks Room in Watterson Towers Residence Hall. The dedication of the newly renovated Rosa Parks Room in Watterson Towers now includes a permanent exhibit that highlights key moments in the Civil Rights Movement, and looks to Parks as more than the woman who refused to give up her seat on a bus. An exhibit from Professor Shelly Clevenger’s Victimology class viewed violence through the eyes of a child. Affinity groups celebrated commencement with ceremonies that included Umoja, Lavender Graduation, Nuestros Logros, and the new MAPS—a celebration of Middle Eastern, Asian, Pacific Islander, and Southeast Asian students. The Culturally Responsive Campus Community (CRCC) Conference returned to campus to focus on understanding and approaching conversations on oppression, and to equip attendees with strategies to talk about oppression in their workplaces and lives. 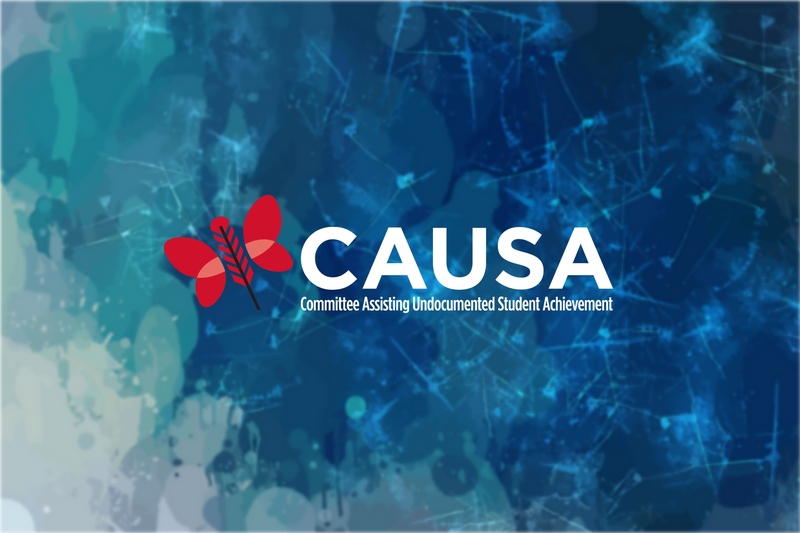 The Committee Assisting Undocumented Student Achievement (CAUSA) logo. Student support groups, such as the League of Extraordinary Genders (TLEG), continue to grow on campus. The Feminist Led Activist Movement to Empower (FLAME) once again led the Take Back the Night efforts. And faculty and staff joined to help for the Committee Assisting Undocumented Student Achievement (CAUSA), which provides support and assistance for undocumented students and the children of undocumented families. Diversity Advocacy’s Black and Latino Male Summit from Diversity Advocacy welcomed speaker Manuel Salgado under the theme “A Different Shade of Color: The Pursuit of Happiness.” The office presented “Tunnels of Oppression” that combined theatre and interactive demonstrations to raise awareness of different forms of oppression. Diversity Advocacy also continued to provide Safe Zone workshops and Lunch ’n Learn speakers. The Mentoring, Academics, Scholarship and Achievement Initiative (MASAI) relaunched through University College to continue work on the retention of first-year underrepresented and first-generation students at Illinois State. 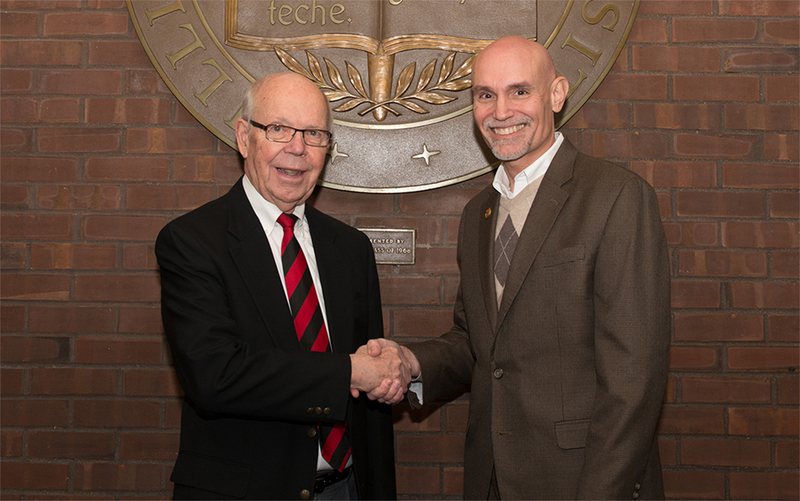 President Emeritus David Strand congratulates Dave Bentlin, the 2017 David A. Strand Diversity Achievement Award winner. Former President David Strand was on hand to help award the Strand Diversity Achievement Award to staff member Dave Bentlin. And organizations, individuals, and programs took home awards at the annual Commitment to Diversity Awards. A new series of workshops from the Center for Teaching, Learning and Technology (CTLT) worked with faculty to ensure dialogues of respect in the classroom with challenging topics that include microagressions and privilege. The Office of Disability Concerns changed the department name to Student Access and Accommodation Services to reflect a commitment to providing an environment of social justice and inclusivity. 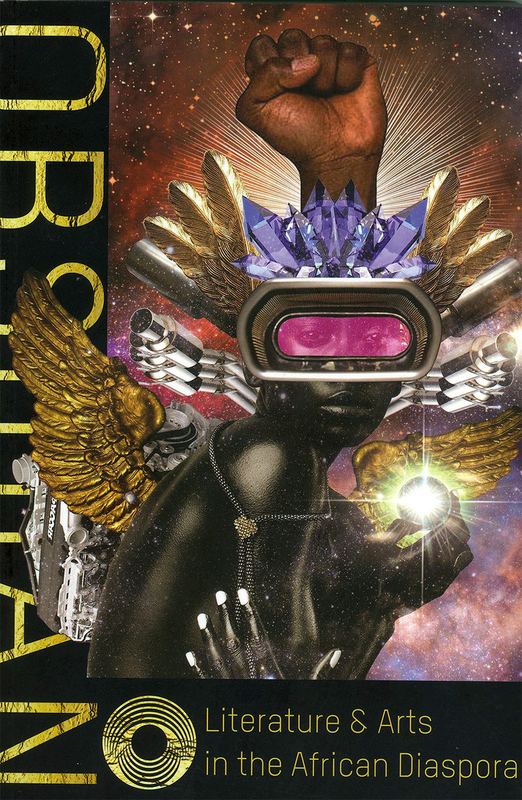 The National Endowment for the Arts awarded a $10,000 grant to support the journal Obsidian. 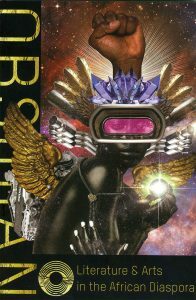 Edited by Associate Professor of English Duriel Estelle Harris, and designed by the University’s Publications Unit, the journal focuses on literature and arts in the African diaspora. Interim Chair of the College of Business Roberta Trites received the honor of the 16th International Brothers Grimm Award. When she receives the award in Osaka, Japan, Trites plans to present a portion of her latest book, Twenty-First Century Feminism in Children’s Literature. One of the favorite sayings of Illinois State University’s President Larry Dietz is “the biggest room we have is the room for improvement.” This idea extends to efforts to increase diversity and inclusion on campus, one of the core values of the University. For future stories highlighting some of the campus efforts toward diversity and inclusion, stay tuned to the Identity newsletter throughout the year.